Overall length is under 82 inches so KingQuad 400FSi Camo 4 x 4 fits into a 6.5 foot truck bed. Dual front hydraulic disc brakes feature calipers with a large 34 mm piston diameter and maximum brake-pad surface area for increased stopping power and outstanding durability. Large, 25 inch Maxxis tires with aggressive dual-stage treaded pattern offers consistent traction in wet conditions and a quiet, smooth ride on hard-packed trails. Overall length is under 82 in. so KingQuad 400FSi Camo 4x4 fits into a 6.5 ft. truck bed. Independent front A-arm suspension design offers smooth performance and remarkable ground clearance and allows 6.7 in. of wheel travel. A swingarm rear-suspension system with 6.7 in. of wheel travel and class-exclusive twin shock absorbers provides agile handling and plush responsiveness. Large, 25 in. Maxxis tires with aggressive dual-stage treaded pattern offers consistent traction in wet conditions and a quiet, smooth ride on hard-packed trails. 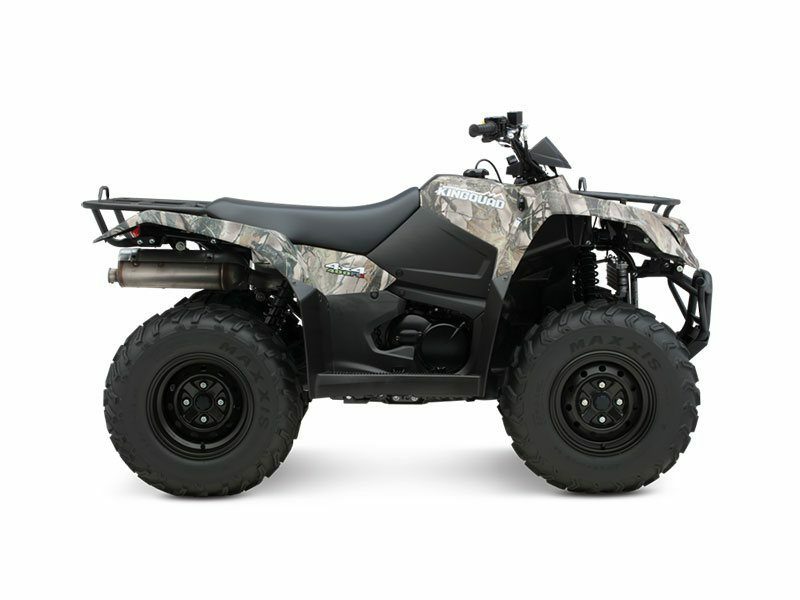 The KingQuad 400FSi Camo features a fuel-injected 376 cc four-stroke, four-valve engine with new cam profiles and inner structures of the muffler (for more powerful and efficient performance). The KingQuad 400FSi Camo comes with electric start. A start-in-gear system - functional when the rear brake is applied - allows starting the engine without shifting to neutral when conditions warrant. The KingQuad 400FSi Camo comes with electric start. A start-in-gear system—functional when the rear brake is applied—allows starting the engine without shifting to neutral when conditions warrant. You can select two- or four-wheel drive operation with the flip of a handlebar-mounted lever. The KingQuad 400FSi Camo shaft drive system is reliable and durable, and provides nearly maintenance-free operation. Large 4.2 gallon fuel tank with fuel gauge for outstanding riding range. Large 4.2 gal. fuel tank with fuel gauge for outstanding riding range.